Ok friends, here it is! 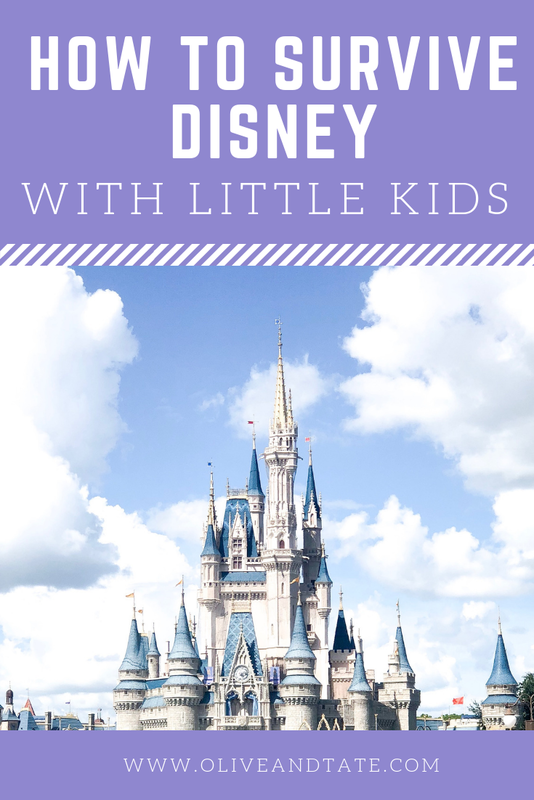 I sat down just three days after leaving Disney World to document all of the things we learned, things we did wrong, things we wish we had known and the best hacks to enjoy Disney with little kids (even if you're not a Disney lover). For me, a trip to Disney is absolutely a trip and not a vacation but strategizing, planning and knowing some of the been-there, done-that secrets will make the process a bit more enjoyable. I highly suggest packing each kiddo using the Ziploc Bag method. This is my first time packing that way and it was a life saver. It's super simple, just label a gallon sized Ziploc with the day of the week, the child's name and an outfit - everything from undies and socks to hair bows. That way, when things are crazy in the hotel each morning, you'll just grab the Ziploc of the day and already have coordinating Disney gear lined up and ready to go. I made sure to pack the bags in our suitcase in order so that we just unzipped and grabbed the next outfit. We had grandparents in Disney with us (bless them) and the Ziploc method made it super easy for someone to get the baby dressed, the preschooler to dress himself and for everyone to end up dressed in their appropriate themed gear. This is also crazy helpful if you want your kids to be dressed according to the day's activities - princess gear for Cinderella's Table, Mickey gear for Magic Kingdom and so on. I packed each kid a back up outfit for each day and threw those Ziplocs into the basket of our stroller. That way if someone get wet on a ride, dripped a Mickey ice cream bar from head to toe or if we had an accident, I was ready to go with an entire wardrobe change. I also used the back up outfits as second outfits if we went swimming in the afternoon - the morning's ensemble was way too sweaty to wear again so we needed fresh gear for dinner and fireworks. Each of my kids also had a Ziploc full of pajamas and bag full of swim suits and rash guards, all labeled and ready to go. Honestly, the Ziploc system has made it easier on me since we've been home because I know that anything still packed in a labeled Ziploc is clean and can be worn until I dig through the Space Mountain sized pile of laundry we brought home from the trip. My 4 year old loved scanning his Magic Band at every ride but when it came to actually entering the parks, the need for him to scan his band and then place and hold his finger still on the fingerprint scanner was a disaster. And, as a heads up, if the finger scan/Magic Band combo isn't completed correctly in three tries, a supervisor has to be flagged down to help you enter the park. It turned out that it was such a supervisor who told us that we could associate an adult's finger print with the kid's bands and our lives got much, much easier. Learn from our mistake and slap an adult finger print on every and all Magic Band that you can. You can add the adult finger print to your offspring's Magic Band at your hotel concierge or via the nice manager at the entry point that you failed to enter, thanks to said offspring's wiggly finger. If you have a baby or toddler in tow, be sure to bring your baby wrap of choice into the park with you. Most of the designated stroller parking areas are actually a bit away from the lines of each ride, plus, even with Fast Passes, lines can be long. My 24 pound toddler had to be toted through each line and my arms were aching by the end of Day 1. I packed our Baby Bjorn in the basket of our stroller and wore her through lines and on a ride or two. She napped in the Bjorn and I even handed off the wrap to my mom when the baby needed a snuggle or two to make it through the day. 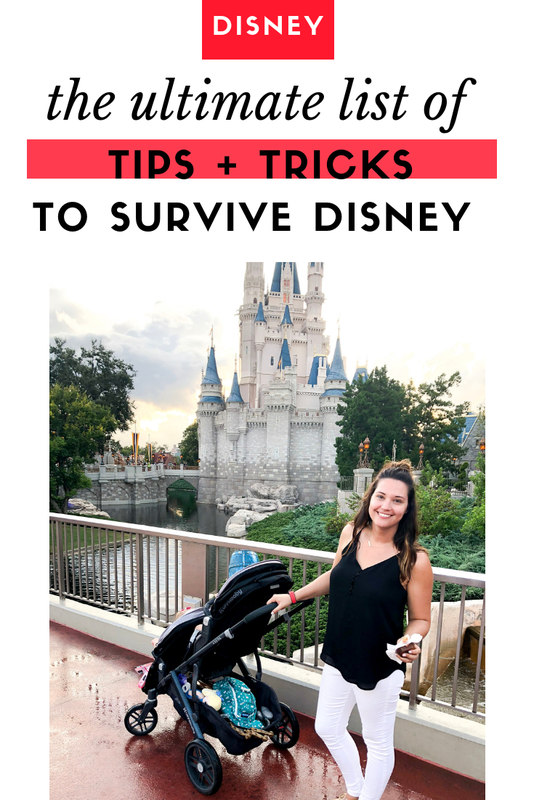 As a heads up, all strollers need to be broken down for monorail and bus rides to various parks so if your stroller is tough to fold, you may want to plan ahead with an easy sit and stand option. We took our full Double Stroller and had no issues but it was bulky and a little difficult to manage on crowded bus rides. I would suggest bringing a stroller even if your kids are a elementary school aged for a few reasons: 1. it is more walking than even bigger kids are used to and the heat makes it extra exhausting and 2. you can use the basket to carry book bags, purses, raincoats/ponchos/cups that you'll want to have with you in the park. As a side note, we saw quite a few people with bigger kids using foldable wagons that could be pushed to tote their older babes around. Most of them even had a top piece to keep the sun off and, of course, had room for all of the gear the family was toting around. You can rent strollers both inside the parks and through stroller rental companies that will deliver to your hotel room, just be sure that you have something big enough for your kids and your stuff to ride. We did not use any sort of stroller name tag because our stroller has a unique set up and is easy to spot, but if you are worried that your stroller might go home with another family, you can purchase personalized tags or tie a ribbon to the handle for easy spotting. We did have our stroller moved by a Disney employee in one location, which of course gave us a moment of panic, but if you park in designated areas, your stroller will be a-ok.
We found that the best Fast Pass strategy for us was to make all of our Fast Pass reservations for the morning - you are allowed to schedule three Fast Pass rides per day and then, once you use those three, you are granted single Fast Passes, one at a time, until the park closes. With little kids, you're up and ready in the morning, so we took advantage and hit rides while we were all fresh and excited. If the afternoon hit and we were too hot, too tired and so over it, we didn't feel pressured to push through just because we had a ride waiting for us at a certain time. If we got a second wind after nap time, we could use our individual Fast Passes to hit rides that had longer lines. On Sunday afternoon, we noticed the park completely cleared out and there were absolutely no lines for the classic Dumbo and Tea Cup rides in Magic Kingdom. We actually canceled our scheduled Fast Passes for those rides and went through the stand bye lines, saving our Passes for other rides throughout the day. On the flip side, we had two of our scheduled Fast Pass rides canceled by Disney due to those rides needing maintenance. When that happens, Disney grants you each one Fast Pass that can be used anywhere in the park during that particular day. We couldn't wait around for the rides to open back up with littles in tow, so we made the best of it and hit other rides with our freebie pass. Let's face it, the endless merchandise on every Disney corner is literally begging for a kiddo meltdown before you even make it to your first ride. Thankfully, we learned a souvenir trick that worked for our 4 year old and didn't cost us an extra dime: PEZ. Yep, classic PEZ dispensers can be found in every gift shop or stall with princesses, classic characters and such on top. And get this: a PEZ dispenser counts as a "snack" on the (already paid for) Disney Meal Plan. We never came close to using all of our allotted "snacks" so we were happy to use them towards our bribery of choice. We let our 4 year old choose one PEZ dispenser a day - and never once told him that they could hold candy. He has quite a little collection and he loves carrying them around in his backpack - and I love that it's not another stuffed animal and it's something super small to transport back home. If you purchased the Disney Meal Plan, study it before you go. We thought that the Meal Plan was the least explained element of the entire Disney process, which was disappointing and complicated when you're trying to feed a crowd of family members quickly and without additional cost. When you get to Disney, if you have questions, ask the person checking you out at quick meal locations about the best way to make the plan work for you - the employees at quick meal spots have the most experience with making "snacks" into "quick meals" and such, so they are a wealth of knowledge. We ended up leaving the park with something like 6 snack credits left, even after using a ton of them for our PEZ bribery. It will rain while you're in Disney World. 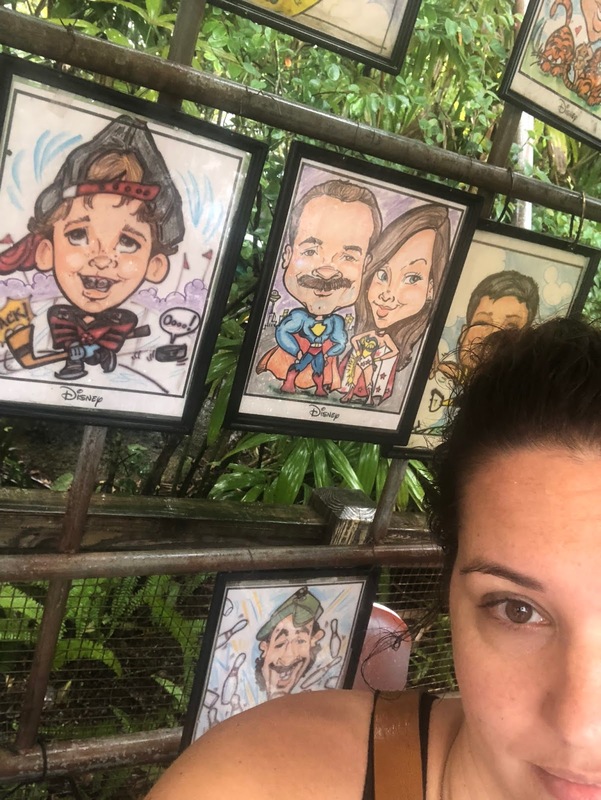 Florida rain showers move in and out quickly so you'll find yourself hiding under a caricature tent waiting things out at least once, if not multiple times on your trip. Bring your stroller's rain shield (or an extra poncho to cover the seats) so that your babes don't end up on soggy seats for the rest of the day. Before you head to Disney, Amazon Prime ponchos for adults because they are pricey in the parks. We brought our kid's rain coats and used them to cover stroller seats while we squished our bodies under tiny spots of overhead shelter and if we did end up getting soaked, we had our back up Ziploc outfits for the kids to change into. Ok, I know Disney is magical and all but, to be very honest, the tap water is gross. If you aren't from Florida, you will probably notice that the tap water has a strong salt/iron/beachy smell. I personally couldn't drink it and I absolutely would not make or wash baby bottles with it. You can have bottled waters or "baby water" sent to your hotel room anywhere in the park via Amazon Prime Now and the bellman will bring it up to your room when it is delivered. I would suggest using Amazon Prime Now for anything that you've forgotten or might need, such as bottled waters or ponchos to avoid spending the big bucks on it inside the parks. All of the hotels accommodate deliveries and we spotted many a bellman delivering Amazon Prime Now packages to rooms while we were there. You can take food that does not need to be heated into Disney World, so plan accordingly. We packed snacks like fruit snacks and peanut butter crackers to keep everyone happy during lines and when we had to wait for sit-down meals and it made all of the difference in the world. 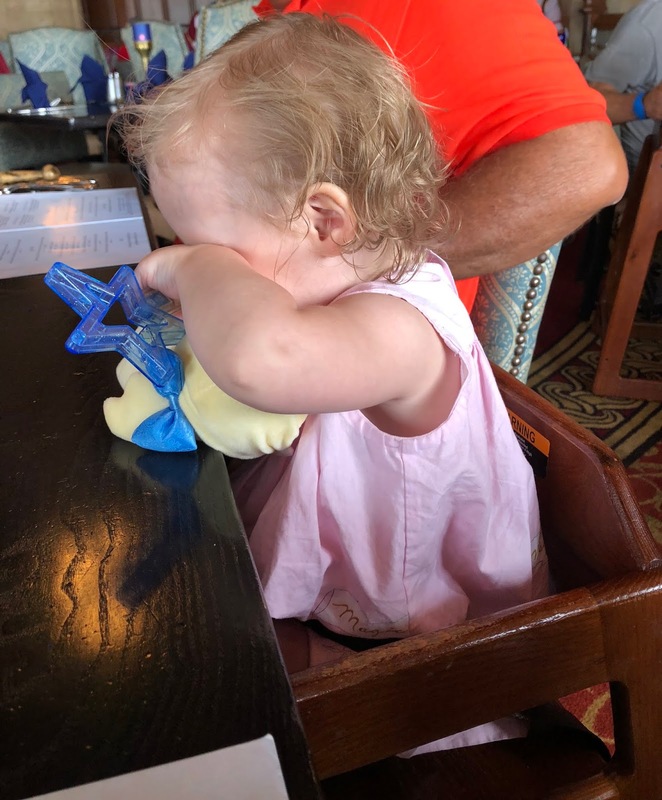 You can also bring in your own cups so be sure to fill up kiddo cups with cold water before you head to the parks -it's hot in Disney, my friends. As a heads up, many of the hotel "stores" sell wine, beer, champagne, cheese and crackers - go ahead and plan to make yourself a post bedtime cheese plate with a big 'ol glass of wine on the side. Disney is smart and has thought of everything, wine is available in full bottles, white bottles can be purchased chilled, splits are available and single glass pours are ready and waiting. Cheeses are everything from wedges of gouda to blocks of cheddar and, if paired appropriately, you can use one of your quick meals to take it all back to your room for no extra charge. And because I know you're wondering; Starbucks holds court on Main Street in Magic Kingdom and just past the Tree of Life in Animal Kingdom. Sadly, you can't mobile order ahead of time but in Animal Kingdom, there are literally 20 baristas, so the line moves quickly. The Magic Kingdom location gets more foot traffic and is always slammed, so plan on a 30-ish minute wait in the am in a tiny establishment for your Pike's Place. If you need a cocktail mid-park, I recommend the margaritas in Pandora, in the very back of the world, to the right of the big rock. If you are hoping for a particularly magical experience with, say, Mickey himself, be sure to plan that experience for the morning. My kids were completely sweaty, red faced and exhausted by lunch time and had little to no patience for long meals, photo ops or magical experiences in their state of exhaustion. We found that making the very first thing of the day the activity that we were all most excited about was a solid plan that allowed us to all enjoy without being hot, sweaty, grumpy messes. Ok, sit down meals. So. I am going to go ahead and say that if you have very small children (mine are 16 months and 4), you should plan those sit down meals very wisely. I would suggest Chef Mickey's Breakfast at the Contemporary and Cinderella's Table - and that's it. Well, we don't take our kids to sit down dinners at fancy restaurants at home because we don't want to wait any longer than we have to, don't want to waste the money on food our kids won't eat and everyone is falling apart by dinner time. None of that changes just because you're in Disney World, I promise. Chef Mickey's Breakfast at the Contemporary is the best way to see all of the classic Mickey characters (perfect for littles who watch Mickey Mouse Clubhouse) and Cinderella's table is really a sweet experience where each of the Princesses spends time with each little one. But even as sweet as Cinderella and her gals were, our family was climbing the walls by the time the entire meal was over. We overstayed our welcome and we knew it. We took advantage of the "quick meal" restaurants (which is basically how we eat out at home) and were just as happy to be able to get in an get out based on our own schedule. As a heads up, we were able to schedule a Chef Mickey and Cinderella's Table while we were in Disney by watching the app for cancelations. It's common and if you can be flexible with timing (especially for Cinderella, I believe our table was slated for 3:40pm), you can probably score a table. Disney is a trip that must be managed. Someone has to be in charge at all times of watching the app for ride closures (we walked all the way to Pandora to find the one ride was closed for maintenance), staying on top of Fast Pass times, keeping up with table reservations and navigating the parks. Honestly, it's exhausting for the person managing and the people being managed. Be sure to schedule/plan/block off time to do nothing. You can get caught up in the "we've got to do it all!!" mentality and forget that your kids would honestly be just as happy playing in the hotel pool. Plan to do the pool. Plan to play in the splash pads, plan to drink in a pool chair, plan to relax. You won't regret it. Depending on where you're staying, parks can be quite a haul from your hotel. We stayed at the Bay Lakes Tower behind the Contemporary which was walking distance to Magic Kingdom but a 20 minute bus ride to Animal Kingdom. On Animal Kingdom day, no one factored in the wait for the bus or the bus ride time so we ended up pushing through naps and stretching the day until the kids fell apart. We just never thought to plan around the commute time and consider how much time we would have lost heading back and forth for naps. If we had known better, I would have planned for a morning by the pool, an early nap time and then made the journey to Animal Kingdom for the remainder of the day. If naps are a must for your squad, ask your concierge how long of a ride it is to your chosen park of the upcoming day, and schedule your day with commuting in mind. As a heads up, you can Uber anywhere in the park so if your crew calls it quits and you know waiting for the bus just isn't a good idea, an Uber will be your fastest, most direct way home. Just like outside of the parks, you can request a vehicle to fit your group size and request car seats if needed. We scheduled our Uber as we were getting off of our last ride and he was waiting for us as we made our way out of the park. I believe the one way cost from Animal Kingdom to the Contemporary was right under $20 and it was worth every penny to be sitting down (most of us stood, holding strollers and gear on the Disney bus), in air conditioning and with Moana playing on the Uber's tv screens. And there you have it! Truth be told, I haven't been converted to a Disney Lover. I still don't really get the deep rooted obsession with all things Disney and, as I mentioned, this is a trip that must be managed every step of the way. There was little to no relaxing, so much sweating (and that's coming from a life long Southerner) and lots of waiting in line, even after we planned everything to the second. Our children were happy and excited, we got to spend time together as an extended family and the hotel was an ideal layout for us, but overall, I'm still just a casual fan. Sorry Disney people, don't hate me! If I think of any more revelations from the trip, I'll update this post, but for now, this is a great starting place to make sure you have a handle on your upcoming Disney trip! Disney with little kids is WORK! We took my now 4 and 2 year old two summers ago, when they were 3 and 1. The 1-year old was a breeze, and the 3 year old caused me more stress. We plan to go again when they are 6 and 4, and I am looking forward to it. I like your bag method for packing!